Take the Moitzfeld exit and go straight ahead 9 km (ATTENTION! Radar controll after Herkenrath). To B506, then take a left (B506 in the direction of Bergisch Gladbach). After 0.8 km take a right at the traffic light in Eikamp. After 150 m the hotel is on the left-hand side. Take the Köln-Dellbrück exit. Turn left. 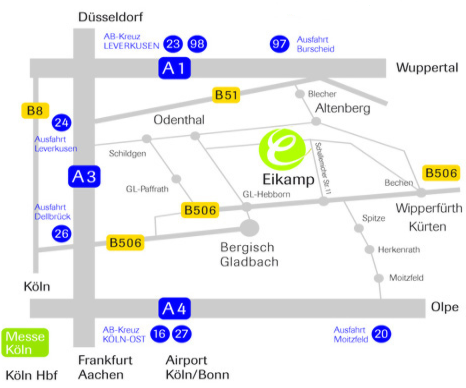 After 3 km (MCDonal Restaurant) take a left at the first street (B 506) towards Wipperfürth. Stay on this road (B 506). After 9 km take a left at the trafic light in Eikamp. Take the exit Burscheid: Head towards Altenberg, then Odenthal (ATTENTION: redar controll in Odenthal). Then ahead towards Bergisch Gladbach. In Hebborn take a left (B506) toward Wipperfürth. After 4,2 km take a left at the trafic light in Eikamp. After 150 m the hotel is on the lft-hand side. Cologne Main Station, S-Bahn line 11 to Bergisch Gladbach, bus line 427 to Eikamp. Arriving at the Airport in Cologne: go to main train station, S-Bahn line 11 to Bergisch Gladbach. Bus line 427 to Eikamp. Good public transportation tot he trade fairs in Köln and Düsseldorf.